Back to work again tomorrow (it was a public holiday today for ANZAC Day), but it’s only a two-day week for me this week, as I’m taking Friday off work to pick Glenn & Tracey up from the airport – then on Saturday they head off somewhere else, and I head up the coast for the night … hence no stitching planned for the weekend. Then next week I only have Mon/Tue to work as a day shift worker, then it’s back to real shift work again. I have to admit, my body has loved having the regular bedtimes and hours, and mealtimes, but it won’t be long before it’s getting assaulted by weird hours again … my bank balance will be happy, though haha. Congratulations on a great stitching day. And enjoy your short workweek! I agree with Bine. You don’t see the bottom anyway, so no harm, no foul is there is nothing there. I would also agree that you should personalize it on the bottom, though, if you have time. You could just put a simple border, the initials and the year? Oooo, pretty frangipani! Always wanted to see that in real life! Can’t wait to see your stitching update pics! Frangipani is a new flower to me; it’s beautiful! It always seems to be the way things go, something looks so quick and easy to stitch always take longer that we think. I think the initials on the bottom of the biscornu would be quite quick and very nice! Enjoy your time away, Anne!! You seem to be on a stitching roll – doesn’t it feel good?? 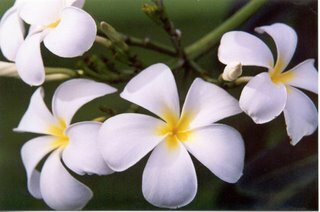 Frangipani is very easy to grow, just snap off a piece and it will grow in soil. So if you find some, easy peasy!! Hi Anne,you are doing brilliantly with the stitching…… congratulations also on attending the Guidance Group! I was petrified before my first one as well, and ended up loving them – 3rd Saturday of the month became the highlight of the month for me. I really miss them, there isn’t anything like that in Paris that I’ve found, even if I were actually at home for more than a few days a month. In Nicosia one of the reasons I am enjoying doing the Lekaritika is that I get to do it with other people, even if communications are limited slightly by my rudimentary Greek.